At the end of his life, with the Vandals already approaching Hippo, Augustine was carrying on a long polemic, all for publication, with John of Eclanum. (It is amazing how much the theological discourse of the early Church resembles Internet flame wars.) Brown suggests that Augustine might have done better to read Julian more carefully, since Julian was close to the sort of workable synthesis of theology and Aristotle that Thomas Aquinas was to achieve many centuries later. Aurelius Augustinus, known to history as Saint Augustine, Bishop of Hippo, lived from 354 to 430. When he was born in Thagaste (a town in the Province of Numidia: perhaps the Roman equivalent of the American Midwest), a provincial like himself might hope to pursue a career as a public intellectual in Italy and the great cities of the east. At the time of his death, Rome had already been sacked 20 years before. Roman Africa, long the most secure region of the empire, had collapsed in the space of two years. The Vandals were besieging Hippo Regius, the port city where he had been bishop for 35 years. There are many reasons for studying the life of Augustine, but among them is surely the fact that he was a highly articulate man who lived at the end of the world. This biography by Peter Brown is now almost 40 years old. Since he finished it, Brown became one of the leading authorities on late antiquity. This edition includes an epilogue with some second thoughts and a survey of writings by Augustine that came to light in the last quarter of the 20th century. It is hard to imagine what more one could want in a book this size, but as Brown himself points out, it has certain blind spots. He follows Augustine's theology only to the extent it seems to have some psychological significance for Augustine or the culture of his period. 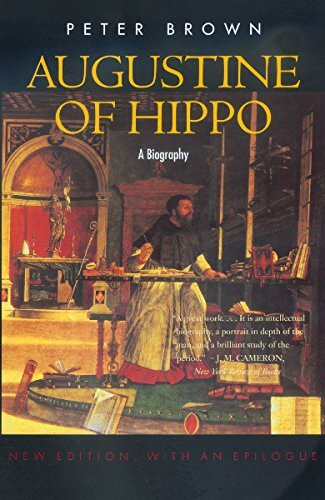 Brown also notes that, while our growing understanding of Augustine's society makes him appear no less original, it also highlights the fact that the Bishop of Hippo did not loom as large as earlier historians had assumed. I have often felt there to be a problem with Shakespeare studies: they forget that, when Shakespeare was alive, being Shakespeare was not such a big deal. Something similar may also have been true of Augustine. The future saint was born about 400 miles west of Carthage, a Roman city on the site of the Roman Republic's ancient enemy, and about 150 miles southeast of Hippo. The region was traditionally a granary of the Roman Empire. Augustine's hometown, Thagaste (Souk Ahras in modern Algeria) was a conventional Roman grid-city, but going to seed. Major building had stopped for almost a century, and the neat layout of streets was supplemented by warrens of shantytowns. There are continuing questions about Augustine's ethnicity and knowledge of languages that this book does nothing to clear up. Some secondary sources say baldly that “Augustine spoke Punic,” which they identify with the Semitic language of ancient Carthage. Brown says no; he even says that the “Punic” to which Augustine and his contemporaries referred was actually a form of Berber. In any case, Augustine in later life did seem to need an interpreter to deal with the country people from the non-Latin-speaking parts of his diocese. Augustine's education, in Thagaste and Carthage, was based on scraps and tatters of Roman authors. It involved the minute analysis of great chunks of Cicero, but as Brown points out, Augustine as a student seems not to have encountered any philosophy as a coherent system, not even in translation. He studied Greek, and he could make translations at need, but he could not write or speak it. His family was Christian, or at least Monica his mother was (his father would be baptized on his deathbed). However, part of his difficulty as a young man with Christianity was that the Latin translations of the Bible then in use were subliterary. Only much later would Augustine's friend, Saint Jerome, produce the Latin Vulgate version that would remain standard throughout the West even after Latin ceased to be spoken. Like the King James Version, Jerome's Vulgate may have been too pretty for its own good. Augustine's first conversion, if we may use that term, was to Manicheanism, a form of gnosticism created in the 3rd century by Mani, a prophet from Mesopotamia. This doctrine held that the evil in the world was the result of there being two principles, dark and light, evil and good. The disgust with the mere physicality of human beings that people of all religious persuasions felt in late antiquity made this doctrine intuitively attractive. The late empire was nominally Christian and Manicheanism was proscribed, but it created little cells everywhere, in a manner reminiscent of Masonry, or for that matter, of 20th-century Communism. Augustine was a fellow traveler. He quickly found problems with it, however. The sacred texts of Manicheanism were not subject to philosophical inquiry. Doctrines about the movement of the moon were central to the system, but Augustine knew enough astronomy to know that they were nonsense. There was also the deeper problem that the Manichean Light was helpless. The Elect might hope to purify themselves of darkness, but there was nothing to be done about the state of things in this life. If the Light could do nothing, then why bother about it? According to some historians, notably Toynbee, the real date for the fall of the Roman Empire is 378, when the Visigoths killed the emperor Valens at the Battle of Adrianople and the empire lost control of the frontier in the Balkans. Contemporaries recognized the gravity of that event. Still, it was not so serious that Augustine could not sail for Rome in 383 to teach rhetoric at an advanced level. As a teacher in Rome, he famously discovered that Roman students were deadbeats about paying their school fees. A little later, influential contacts and natural ability secured him an appointment as a professor of rhetoric in Milan in northern Italy. In effect, he was an imperial flack, work that he did not appear to find satisfying. We should remember that Milan was then the capital of the empire in the West. In the empire's last two centuries there were normally two emperors, nominally colleagues, with the senior emperor resident in Constantinople and the junior somewhere in Italy. The effective seat of government had actually shifted to Milan as early as the 2nd century: under the empire at its height, its rulers discovered that, strategically, Rome was in the middle of nowhere. Later in Augustine's life, the government would move permanently to Ravenna. There it was no more effective, but it was at least protected by marshes. In Milan, Augustine completed the transition to Platonism that he had begun long before. By “Platonism,” he meant what is now called “neoplatonism,” the mystical, even ecstatic doctrine of Plotinus and Porphyry, but which people of Augustine's day saw as perfectly continuous with the school of Plato. In any case, the doctrine was a revelation to him on several levels. To begin with, this was his first acquaintance with the idea that there could be real entities that are not material. The Light and Dark of the Manicheans were thought to be different kinds of stuff. Even the grossest superstitions of late antiquity were “materialist” in this sense, as indeed were most forms of late Classical philosophy. Augustine saw that the notion of the non-material Idea was far more useful. More important, Augustine saw that the Good need not be helpless. Quite the opposite: it was overwhelming. In the neoplatonic view, the world we see is simply a pale image of the Good, which exists at the summit of the chain of Being, each link of which is more perfect than the one below. Neoplatonism promised direct experience of the Good, which was also the Beautiful and the True, through contemplation and asceticism. This was a rather more satisfactory goal than the ritual purity of the Manichean Elect. Many sophisticated pagans made their peace with Christianity through Platonism, which they believed allowed the common people an image of the Good. Platonists of this sort might attend church in good conscience, without being baptized, as a social convention. Augustine was a member of this class for a time, perhaps. However, in Milan he met not just sophisticated Platonists, but also sophisticated Christians, the most important of whom was the city's famous bishop, Ambrose, later to be acclaimed a saint. Ambrose successfully faced down emperors when the need arose. He also succeeded in overcoming Augustine's largely literary prejudice against the Christian scriptures. In any case, Augustine's experiences in Milan led up to the day in 386 when, in an Italian garden, he heard a child's voice say, “take up; read.” His encounter with scripture in response to this injunction completed his conversion to Christianity. His baptism soon followed. He then set about reforming his own life; a little later, he turned his attention to reforming other people's lives. We remember Saint Augustine because of the record he left us of his discovery of the extent to which these things were and were not possible. During the next two years, Augustine briefly lived in a group home, a sort of proto-monastery, with similarly minded philosophical Christians. Like most people of his day, he assumed that deep conversion would require a renunciation of married life, if not quite of family life: Monica, his mother, had followed him to Italy and apparently managed his household. In any case, he canceled plans for marriage to an heiress. He also sent away his concubine, by whom he had had a son, who died as a young man. (“Concubine” sounds rather racy in modern English. In the Greco-Roman world it was a prosaic arrangement in the nature of a “civil union,” though not generally a union of equals.) Monica's Catholic orthodoxy was not the least of the influences in her son's conversion. She died just before they were all about to return home to Thagaste. She became a saint, too. Brown notes that Augustine left Italy at just the time when it began to cease to be true that all roads led to Rome. He would do business all the remainder of his life with the government in northern Italy and with the pope in Rome, but he belonged to the last generation of provincials who went to Rome to make their reputations. Through invasion, and even more through irresponsible uprisings by local commanders, the wheels were starting to fall off the political system. Increasingly, the empire was unable to guarantee the security of its citizens, even at the cost of oppression. Back in sheltered Africa, though, Augustine now had a reputation as a man of learning and good character, so much so that he was essentially drafted as a priest by the congregation of the basilica of Hippo in 391. Four or five years later, he became bishop. His transformation began into Saint Augustine, the great Doctor of the Latin West. Augustine wrote quite literally a library of books. When he spoke of his library at Hippo, in fact, he seems to have been referring to a small research and publishing enterprise, dedicated in no small part to disseminating the wide range of texts he produced. Still, when people talk about Augustine, they are normally talking about two books: the Confessions, which began to appear about 400 and which deals with his conversion; and The City of God, parts of which began to circulate in 413, and which tried to make sense of the sack of Rome three years before. Two points are particularly interesting about the Confessions, in light of what we know about Augustine's background. The first is that, despite Augustine's Platonic readiness to conceive of God as an intellectual object, Augustine seems him as the prime mover in his conversion. The book, in fact, is largely a second-person address to God, to Whom Augustine recounts how God led him through reason, through joy, and through happy accident to that garden where Augustine heard the child's voice. For someone who had recently been a Manichean, this was a very favorable assessment of world of the senses. Human nature itself was full of handles for God to grab onto. The other point is that the story does not end with Augustine's conversion. That was unusual: conversion narratives, then and since, often assumed that the protagonist would be effortlessly holy ever after. Neither was it usual for high paganism: neoplatonic philosophers and Stoic sages were supposed to “get it,” to achieve enlightenment, and then to live an untroubled life in semi-retirement, where they would try to explain the ineffable to eager students. As we have seen, Augustine actually tried to do something like that, but discovered he was not good enough. Even after his conversion, he was still Augustine. He needed God's help at least as much after his baptism as he needed it before. Perfection in this life was not an option. This was, perhaps, why Augustine had little patience with sects and theological opinions that promised perfection, or that even said it was possible. One such sect was the Donatist Church, a schismatic group that was actually the dominant church in Africa when Augustine returned from Italy. It grew out of the last pagan persecutions. In those days, many Christians, clergy included, apostatized to save their lives, but later repented and were received back into the church. The Donatists were the institutional descendants of some of those who had not apostatized, and who refused to recognize the repentance of those who had. They also did not recognize the power of former apostates to baptize, or ordain their successors. The Catholic Church did exist in Africa, in the sense of bishops who were in communion with the bishops of the patriarchal sees, and especially with Rome, whose bishop enjoyed a unique primacy even then. It was the Catholic bishops that were recognized by the imperial government. The Donatist Church differed from this universal establishment in no point of doctrine or liturgy. The Donatists differed only in claiming that they were a church of saints: they were the true Church in Africa, and maybe the only true church in the world. Augustine attempted to heal this schism through persuasion and polemics, not wholly without success. In the final analysis, though, it was the willingness of the imperial government to seize Donatist property and place the Donatist faithful under civil disabilities that destroyed Donatism, or at least drove it out of the cities. Augustine justified persecution, at least at this relatively moderate level, for much the same reason that he had recognized the necessity of the world for his own conversion. The social environment can lead us to God, but this implies that the environment must be cleared of delusions and distractions. Augustine was prepared to use the state toward that end. This is not to imply that when Augustine said “jump!” the Proconsul in Carthage asked “how high?” Particularly in the letters that came to light in the late 20th century, we see Augustine working as an ombudsman between his flock and a government that was becoming simultaneously less competent and more brutal. He tried to get pardons for tax protesters. He tried to get death sentences commuted. He tried to stop a new and appalling recrudescence of the slave trade. Taking advantage of the eclipse of imperial order, private entrepreneurs had taken to capturing free peasants in Africa and selling them to buyers in Gaul and Italy. They embarked their captives through Hippo, under the nose of the port authorities, who had been bribed. When members of Augustine's cathedral chapter sought legal redress for some of the captives, the slavers sued for interference with their business. Augustine was not an uncritical admirer of the Roman Empire, which, again, was somewhat unusual for a man in his position. The tendency of his time was to increasingly regard the empire as a providential historical development, created by God to foster and protect the Church. The ideology of the medieval Holy Roman Empire was not so different; Dante's theory of universal monarchy made the Church and the Empire equivalent divine institutions. Brown emphasizes that Augustine was skeptical of these ideas long before the sack of Rome in 410. After that event, he canonized his measured dismay of those years in his greatest work, The City of God. Brown notes that the immediate audience for the book consisted in significant part of literary refugees from Italy. In fact, the book started life in part as a series of sermons. Augustine explains that the Church, City of God, was a pilgrim in this world. (“Pilgrim” did not suggest to Augustine that to travel hopefully was better than to arrive; he always hated traveling.) It could cooperate with the City of Man, with which it was inextricably connected. Indeed, as citizens, Christians had some duty to work for that City's good. However, the City of Man was ultimately transitory. It could not command our final loyalty. Augustine was a patriot. He knew the empire was in trouble, but he said it might recover, as it had done so many times before. And in fact it did recover for a few years; Alaric the Visigoth turned out to be more an unsuccessful extortioner than a world conqueror. Augustine, clearly, was wise not to link the troubles of his contemporary world with the prophecies of revelation (one of the great faults of Brown's book is that we get almost no discussion of Augustine's views on eschatology). What Augustine did do was create the historical framework for a livable world. Augustine has even been called “the father of progress,” since he held open the prospect that the betterment of the secular world was at least possible. Interesting as all this is, the issue that made Augustine's reputation was the controversy with Pelagius about free will, predestination, and original sin. Pelagius, a man of British extraction, argued against the doctrine that we are born tainted by original sin. He also argued that the human will, informed by teaching, was capable of rejecting sin and choosing the good. In many accounts of this debate, Pelagius is portrayed as the champion of reason and human autonomy, while Augustine is seen as the proponent of infant damnation and of a God who arbitrarily predestines some fraction of the human race to Hell. Brown's thesis is that, at every point, Augustine's concern was actually to make the Christian life livable. Pelagius's account of the autonomy of the will meant that people bore a terrible burden for their own choices. In Pelagius's system, the least infraction of divine law merited damnation. Pelagians laid great stress on the value of threats of hellfire to encourage the faithful to greater efforts. To that Augustine responded, oddly like a philosopher of the Enlightenment 1,300 years later, that a man who fears hell does not fear sinning, but burning. And in fact, the Pelagian party was not a would-be Broad Church of moral uplift, but yet another example of Late Antique spiritual athletes trying to form a tiny minority of the elect. When Augustine defended original sin, he was defending the power of the rite of baptism to offer some surety of salvation, even to infants. Augustine's version of predestination rejected the notion that one could say that conversion and continuance in grace were either personal choices or divine intervention; he did insist that the unaided human will was insufficient. He cited scripture, but this insight is really what the Confessions had been all about. In his debates with Pelagius, Augustine articulated a concept of freedom that has fascinated and repelled the West ever since. In this view, the mere perception of a choice is evidence of the corruption of the will. True freedom, in contrast, means transcending choice. A truly free man is one whose will has been so cleared of error and bias, particularly the biases created by desire, that he can see there is only one real possibility. This has a fine Hegelian ring to it: freedom is the conformance of the will to necessity. And like the politics that descends from Hegel, it can be breathtakingly oppressive. At its worst, it means than a government can ignore popular opposition to its policies as the product of false consciousness, or that an established church could assume that there is no such thing as an honest heretic. On the other hand, the procedural notion of freedom, as a choice that is externally unrestricted, is subtly self-contradictory. The existence of objective value in the things we are choosing among, that is, the possibility that a choice might be right or wrong, is the kind of external constraint that a procedural system has to ignore or suppress. Freedom then means the right to choose between things that there is nothing to choose between. The philosophical question remains with us, but Augustine did succeed in settling the matter for a long time as far as dogma went. A council of eastern bishops found nothing wrong with Pelagianism (the Greek church has never very interested in psychological questions), but Augustine had enough influence to light a fire under several popes to get Pelagianism condemned. Even then it did not lack for brilliant defenders. At the end of his life, with the Vandals already approaching Hippo, Augustine was carrying on a long polemic, all for publication, with John of Eclanum. (It is amazing how much the theological discourse of the early Church resembles Internet flame wars.) Brown suggests that Augustine might have done better to read Julian more carefully, since Julian was close to the sort of workable synthesis of theology and Aristotle that Thomas Aquinas was to achieve many centuries later. There are ironies in the aftermath to Augustine's life. The world that he was trying to make tolerable for Christians did not survive him. The Catholic Church in Africa was soon being oppressed by the Arian Church of the new Vandal kingdom. A little later, and the Vandal kingdom was conquered by the Byzantine Empire, whose Greek orthodoxy Augustine would have recognized as Catholic, but which was imposed by force over sullen populations with their own ideas. Three centuries later the Arabs came, and Latin-speaking, Christian North Africa evaporated as quickly and thoroughly as had Roman Britain. Almost all that is left of that world is the writings of Saint Augustine. As it happened, his was the last voice from the Latin West of antiquity.